Getting 8-9 hours of sleep is a huge priority for me and I generally try to be in bed between 9:30 and 10:00 pm. Of course, that doesn’t always happen but if I sleep less than 7 hours I make myself skip my morning workout…and I really don’t like to do that. I try to set my alarm and put my phone on the charger one hour before bed before I start the next steps. I know that doing that sooner is probably a better idea, but I love to connect with all of you on Instagram and find myself writing back to a lot of your messages in the evening. The great thing (which I used to think wasn’t so great when I first moved into my apartment) is that wifi doesn’t work in my bedroom. I’ve tried to get another router and it just simply doesn’t work..my room is like a black hole. I’ve learned to embrace it. I open my window about an hour before I go to sleep in order to cool down the temperature to the ideal 70 degrees Fahrenheit (21 degrees Celsius). I put a couple drops of either Lavender essential oil or my favorite nighttime blend from doTERRA called Serenity (mix of Lavender Flower, Cedarwood, Ho Wood Leaf, Ylang Ylang Flower, Marjoram Leaf, Roman Chamomile Flower, Vetiver Root, Vanilla Bean Absolute, Hawaiian Sandalwood Wood) in my diffuser in my bedroom. Sometimes I’ll add a couple extra drops of On Guard essential oil to boost my immune system and keep me healthy and strong. After I’ve opened my window and started my diffuser I take a bath. Sometimes I’ll add a tablespoon of coconut oil and some drops of Lavender essential oil to really relax and moisturize my skin. You can mix this magnesium powder in hot or lukewarm water…but I prefer hot. This is the best nighttime beverage to warm me up and calm me down. Plus, it’s a very pleasant stool softener that keeps things moving without any complications. After I get out of the bath, I put Lavender or Serenity essential oil on my feet with coconut oil and put socks on. Additionally, I’ll put the Lavender or Serenity on my lower back, behind my ears and on my upper lip so I can really smell it. As with the diffuser blend, I sometimes add On Guard on my feet as well for an added boost to my immune system. After my hormonal transformation, I’ve completely sworn off all pharmaceuticals or over-the-counter meds, I’d rather keep my immune system fighting strong before I get sick rather than treating it when it’s “too late”. This ritual is really the same every night. 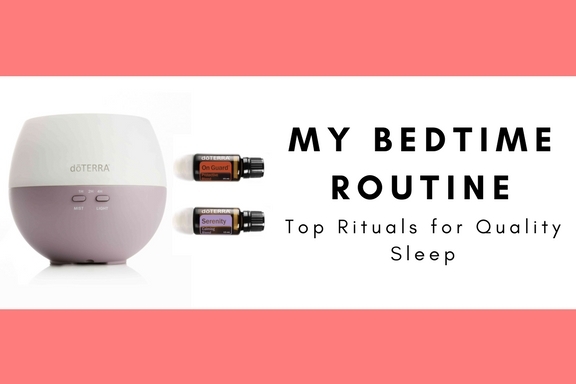 Even when I am on-the-go I keep my favorite essential oils for travel with me – Lavender included 🙂 Keeping things the same before I go to bed really ensures I go into relaxation mode almost immediately. If you’re interested in ordering essential oils from doTERRA, you can find out how to sign up and receive 25% off for life!